Hello, everyone. Welcome to episode 162 of Against the Odds. Last week, we had our final all-Guilds of Ravnica Against the Odds poll, and in the end, the reverse Yawgmoth's Will Mnemonic Betrayal came out on top. 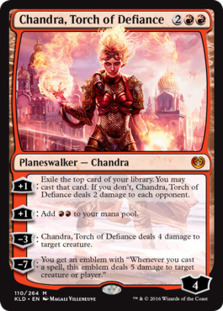 As such, we're heading back into the super-sweet Guilds of Ravnica Standard today to see if we can win some games with our opponents' decks! I was a bit worried when Mnemonic Betrayal came in first on the poll because the sorcery doesn't really lend itself to any specific combos and its power is mostly based on the power of the cards in our opponent's deck (which we can't control). Eventually, I realized that the right way to build Mnemonic Betrayal in Standard was obvious: we just go all-in on stealing our opponent's cards and hope that we can play our opponent's deck better than they can! The end result is Your Deck Sultai—a deck overflowing with ways to steal our opponent's cards and hopefully use them to pick up the win! What are the odds of winning with Mnemonic Betrayal in Standard? Let's get to the video and find out; then, we'll talk more about the deck! Since Mnemonic Betrayal doesn't really lend itself to any specific combo or deck, rather than building around the effect of the card, we're building around the theme of stealing our opponent's cards and playing them! The basic idea of the deck is to load up on as many cards that can steal our opponent's cards as possible and hope that we can play our opponent's deck better than they can. Mnemonic Betrayal is basically our finisher. In the late game, we can cast it and potentially play several cards from our opponent's graveyard. While what these cards are will depend on our opponent's deck, in theory, it shouldn't really matter what our opponent is playing if we have enough mana, since Mnemonic Betrayal will draw us a bunch of good cards and hopefully generate enough value for us to win the game. Backing up Mnemonic Betrayal are Hostage Taker and Thief of Sanity as more ways to steal our opponent's cards. 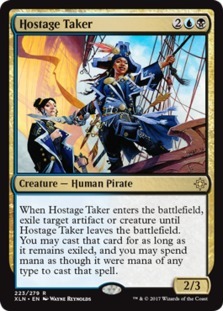 Hostage Taker is pretty simple: it's basically a removal spell that allows us to steal our opponent's creature rather than just killing it. 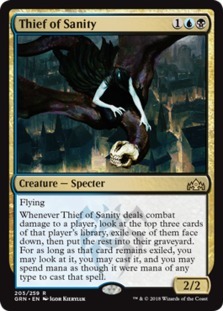 Meanwhile, Thief of Sanity is the perfect card to play with Mnemonic Betrayal. 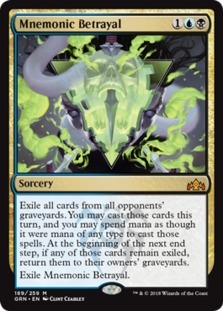 Not only does it give us another way of playing with our opponent's deck, but it also helps to stock our opponent's graveyard with cards that we can later play with the help of Mnemonic Betrayal. Our last way to steal our opponent's cards is Dead Man's Chest. Right now in Standard, a lot of decks are playing big creatures like Crackling Drake and Wildgrowth Walker. 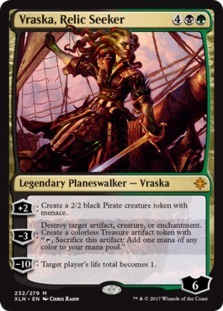 If we can manage to enchant one of these creatures with Dead Man's Chest and then kill that creature, we end up exiling (and eventually casting) a big chunk of cards from our opponent's deck. While the plan can be a bit slow, since we need to draw not just Dead Man's Chest but also a removal spell to kill the enchanted creature, when things go well, Dead Man's Chest can draw us five or even 10 cards for just two mana, which is a pretty great deal. Meanwhile, Muldrotha, the Gravetide gives us a way to replay our Dead Man's Chest (and other card-stealing creatures like Hostage Taker and Thief of Sanity) in the late game. While one Dead Man's Chest is fine, when we are casting it and killing the enchanted creature every turn with the help of Muldrotha, the Gravetide, the advantage we generate is insurmountable. While removal is important in general, it's especially important in a Mnemonic Betrayal deck since killing our opponent's creatures is one of the easiest ways to get cards in their graveyard that we can then cast with Mnemonic Betrayal. 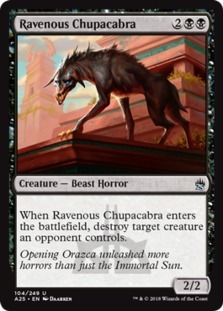 Plaguecrafter and Ravenous Chupacabra give us removal spells that we can recast with Muldrotha, the Gravetide in the late game. 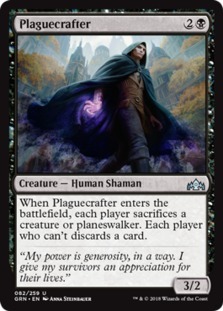 Plaguecrafter is especially strong, since it gives us a way to sacrifice our other creatures (like Hostage Taker) so we can cast them with Muldrotha, the Gravetide the following turn to reuse their enters-the-battlefield triggers. 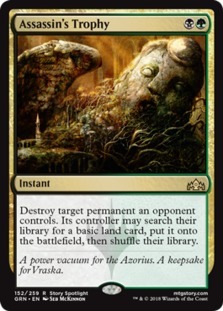 Assassin's Trophy takes down anything at instant speed, giving us an answer to annoying permanents like planeswalkers or even random artifacts or enchantments. 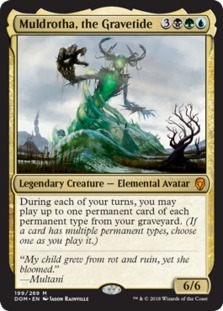 Meanwhile, Find // Finality and The Eldest Reborn offer removal that does double duty by returning creatures from our graveyard, giving us yet another way to get back Thief of Sanity or Hostage Taker to steal more of our opponent's cards, or Plaguecrafter or Ravenous Chupacabra for removal. The Immortal Sun and Patient Rebuilding are in the deck specifically to combo with Mnemonic Betrayal. The Immortal Sun makes all of the spells we cast cost one less, which includes all of the cards we cast from our opponent's graveyard with Mnemonic Betrayal, allowing us to cast as many of our opponent's cards as possible when we resolve our namesake card. 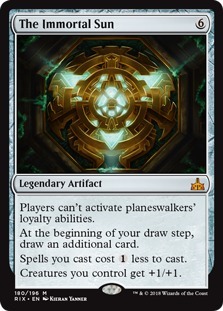 The artifact also gives us an answer to opposing planeswalkers, which is important with various Vraskas, Teferi, Hero of Dominaria, and Vivien Reid being heavily played. Meanwhile, Patient Rebuilding gives us an easy way to get cards into our opponent's graveyard by milling our opponent each turn while also drawing us cards to help make sure we find our Mnemonic Betrayal and other stealing cards. 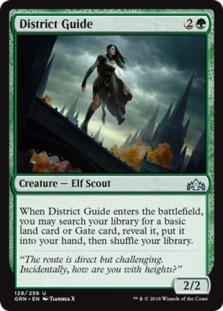 Finally, Orazca Relic and District Guide help us ramp into our Mnemonic Betrayal. 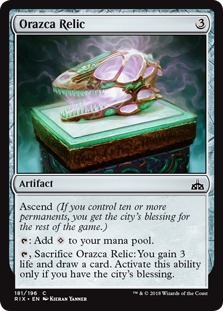 The more mana we have on the battlefield when we resolve our namesake sorcery, the more cards we can cast with it, so making sure we hit our land drops with District Guide and ramping with Orazca Relic is very helpful. Orazca Relic also combos with Muldrotha, the Gravetide, since we can repeatedly sacrifice it in the late game to draw a card and gain some life and then recast it from our graveyard. The biggest thing we learned during our matches is that Mnemonic Betrayal (and our deck in general) really doesn't like Trostani Discordant. 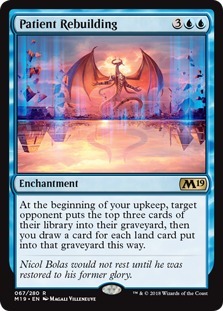 While most people assumed that the "gain control of all your creatures at the end of your turn" text was for Commander, it also happens to be really good against a deck built around Mnemonic Betrayal, Thief of Sanity, Hostage Taker, and Dead Man's Chest. Aggro also feels like a difficult matchup, since our deck is pretty slow, and even if we do manage to steal some of our opponent's cards, they generally aren't very powerful. On the other hand, Your Deck Sultai holds up fairly well against various midrange and even control decks, since our opponent has good cards to steal and they can't kill us very quickly. In general, Your Deck Sultai is a unique deck—since we aren't very good at winning with our own cards, the power level of our deck is mostly dependent on the power level of our opponent's deck, so we're often rooting for our opponent to be playing good cards so we can steal them. All in all, we played five matches and won three, giving us a 60% match win percentage, along with winning seven of 14 games, good for a 50% game win percentage, making Your Deck Sultai slightly above average for an Against the Odds deck. More importantly, we did some crazy things, both good and bad, getting absolutely blown out by Trostani Discordant but also playing our opponent's Elf deck better than they did, eventually winning by stealing nearly every Elf lord in the format along with a bunch of random Elves to pump! 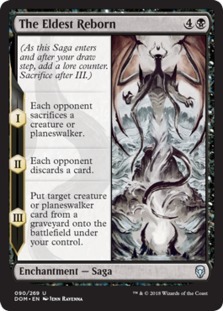 While Mnemonic Betrayal in general and Your Deck Sultai specifically can be wildly inconsistent, since so much depends on the opponent's deck, they're also a ton of fun to play. Nothing's better than beating the opponent with their own cards! Guilds of Ravnica has been great, and while options from the set will still show up on the poll from time to time, we're moving away from all-Guilds of Ravnica polls this week. So, what are we voting on this week? 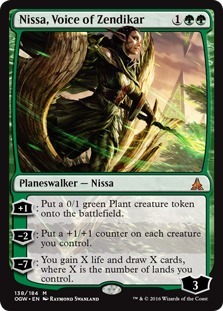 One of the most popular themes on Against the Odds: Planeswalker tribal! 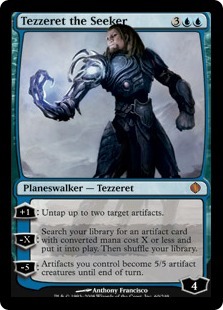 While we've played quite a few planeswalker tribal decks already, there are still several that we haven't covered. 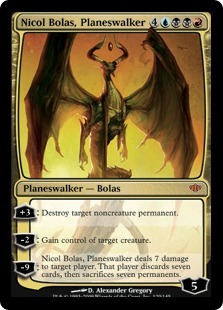 Which of these planeswalkers should we build around next week? Let us know by voting below!